Who? 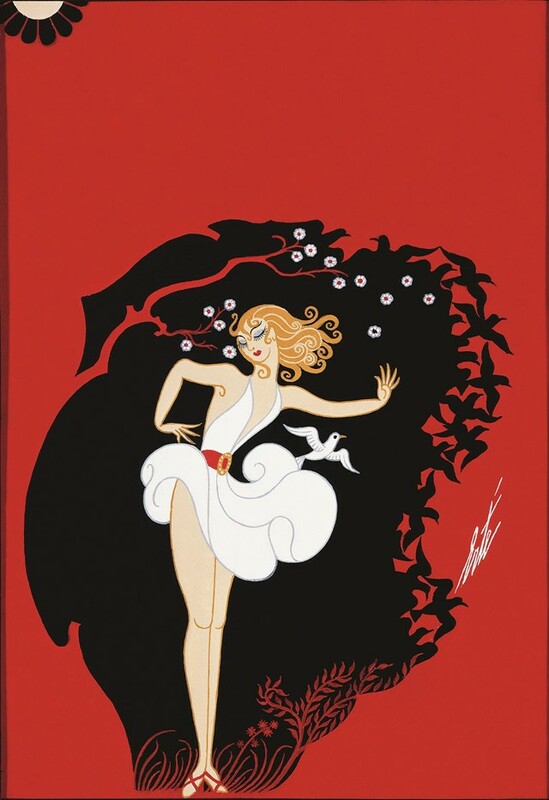 Romain de Tirtoff, better known by his pseudonym Erté (which is derived from the French pronunciation of his initials) was the grand master of Art Deco. His exacting lines depicted elegant, mysterious women, mythical beasts and impossibly opulent surroundings, capturing the essence of a fevered glamour that engulfed the early 20th century. 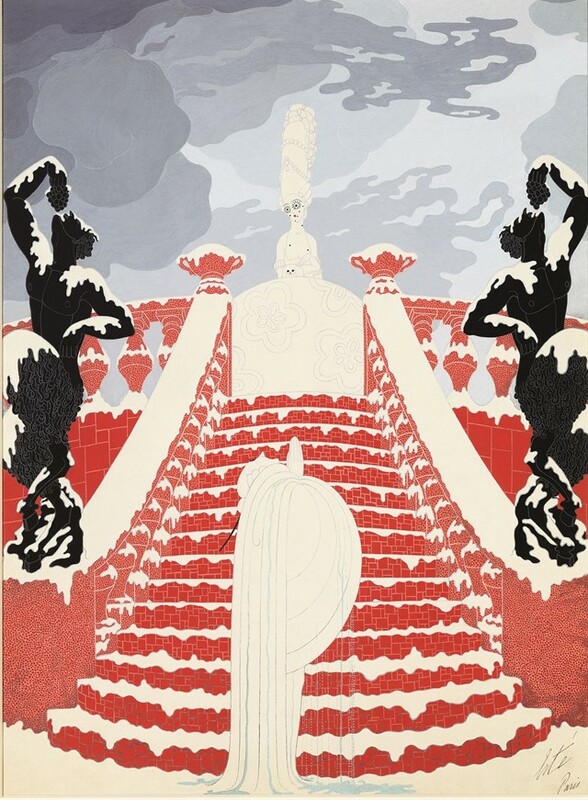 Erté’s influence stretched across the worlds of fashion, theatre and film, where he was known for producing hundreds of Harper’s Bazaar covers, among countless other commissions, not to mention costume design for dancers at The Folies Bergère and a brief foray into accessories and furniture. What? Erté was born in St Petersburg in 1892 and spent his youth enveloped in the splendour of the Ballet Russes, where he was fascinated by the lithe extensions of the dancers and their luxurious costumes. When he first arrived in Paris in 1912 in his early twenties he had little idea about what he wanted to do, so after a vague attempt to study architecture, he approached Poiret – one of the most influential couturiers of the period – with his own designs. This bold gesture was surprisingly fruitful; Poiret recognised both his talent and his unique style, which married closely with the atelier’s vision. Poiret nurtured the young man’s gift yet had the foresight to realise that it would not be contained for long. As so happens, the fashion house closed only a few years later during the onset of the First World War, by which time Erté had already established himself as an exceptional illustrator and designer, having secured his first Harper’s cover in 1915. 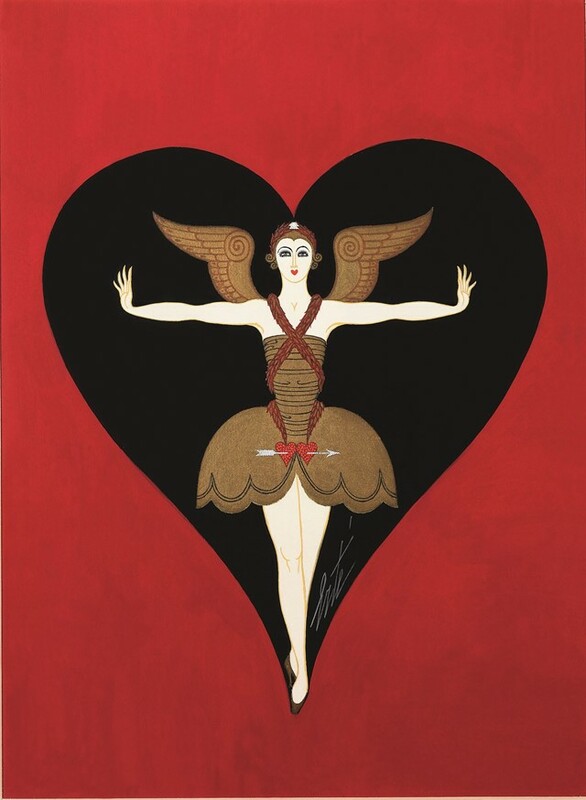 By the 1920s Erté had become the darling of every artistic circle, from Paris to New York. His ability to distil the zeitgeist and infuse his fashion images with seductive flair was unparalleled, and hunger for his work persisted. As he reached the height of fame, he decided to embark on his magnum opus: a series of gouaches depicting every letter of the alphabet. He originally planned to finish the collection in a few months, but the pressure of his commercial work delayed the project by several years. These astonishing, luscious letterforms have often been compared to the illuminated characters found in medieval manuscripts, but Erté always claimed the true inspiration came from Persian miniatures. Although this influence is clear, his wonderfully contorted figures also call upon Greek mythology and are reminiscent of the salacious work of Aubrey Beardsley. This exoticism and glamour is rendered in exceptional detail, and could surely never have operated as functioning typography, for they are singular works of art within themselves. Why? 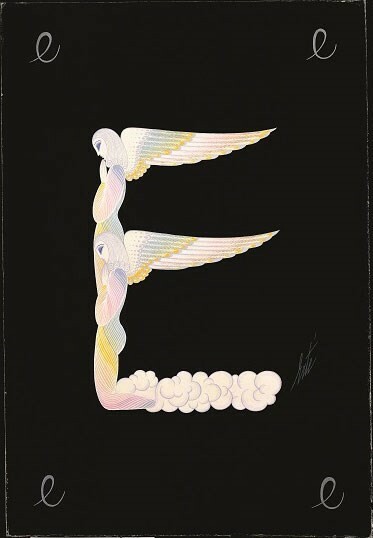 This astonishing alphabet was never exhibited in its entirety until 1967, in Erté’s first exhibition at Grosvenor Gallery. It was only during preparation that he realised ‘Q’ and ‘L’ were missing and was able to revisit the collection in order to fill in the gaps. Although several decades had passed since he embarked upon this series, Erté was more popular than ever. In fact, the 1960s saw a renaissance of everything Art Deco and Art Nouveau, as demonstrated in the décor of London’s Biba and fashion’s return to a lissom silhouette. Since then the artist’s star has never truly dimmed. Now, the same gallery that held this first exhibition is revisiting Erté’s oeuvre with Erté: A Celebration, a show comprising over 100 works and presented to coincide with the 125th anniversary of the artist’s birth. His ability to manufacture entire worlds filled with glamour, sexuality and a strident surreal nature is just as powerful as it was when he first put brush to paper, and although they might recall a particular 1920s aesthetic, there is no denying that Erté’s work is eternally alluring. Erté: A Celebration runs at Grosvenor Gallery, London, until November 30, 2017.